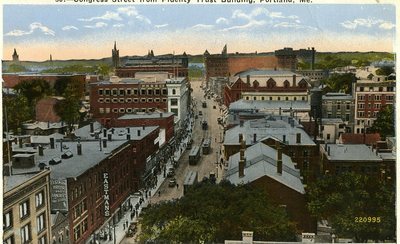 "Portland, Maine, Congress Street Postcard "
An image scanned from a postcard of Congress Street from the Fidelity Trust Building in Portland, Maine. The number 30 appears before the card's title, and the image was also printed with the number 220995 in the lower right corner. Published by the Eastern News Company in Portland, Maine. No date.